Corporate Governance and regulatory pressures have been much in the news lately. How they affect the bottom line of corporations has been difficult to quantify, and research is just beginning to be published that addresses this crucial question. 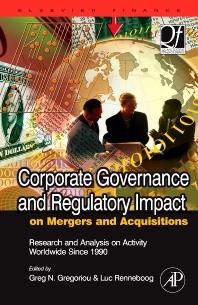 This book is the first collection for new research about the impact of takeover regulation and corporate governance on M&A financial results. It will be essential reading to any M&A specialist, an investment banker, a hedge fund manager, a private equity director, or a venture capitalist. Also a must read for financial analysts who follow M&A targets. The book presents research from around the world so it provides a global perspective on this important topic.